The 4th Annual National Community College Peacebuilding Seminar was held this past weekend at Northern Virginia Community College in Alexandria, VA. The seminar hosted 21 educators from Henry Ford College, Santa Monica College, Montgomery College, Massasoit Community College, College of Southern Maryland, Anne Arundel Community College, Sinclair College, and Northern Virginia Community College. Joining the group were six educators from Sukkar Institute of Business Administration in Pakistan, visiting Johnson County Community College on a State Department grant. The seminar was designed to build capacity in community colleges for teaching about peacebuilding, conflict resolution, global issues, human rights, and related topics. This seminar is the only national seminar for community college educators focusing on global and peacebuilding issues. to teaching about peace. 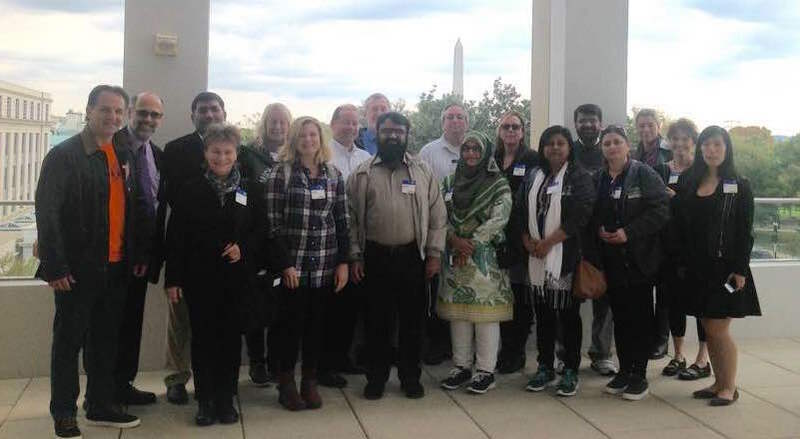 In addition to seminar-based sessions, attendees visited the U.S. Department of State where they were briefed on refugee policy by officials of the Bureau of Population, Refugees, and Migration and the U.S. Diplomacy Center; the U.S. Institute of Peace where they meet with experts from the Afghanistan and Central Asia Program, the South Asia Program, and the Academy for International Conflict Management and Peacebuilding. ; and the U.S. Holocaust Memorial Museum where they visited the “Some Were Neighbors” Exhibit. On Friday, October 21, 2016 the program started with introductions and a welcoming by officials from Northern Virginia Community College, including Dr. Jim McClelland, the dean of liberal arts, and Dr. Annette Haggray, the provost of NOVA’s Alexandria campus. This was followed by a presentation on “Peace, Pedagogy, and the Power of Today’s Global Conflicts” by Daryn Cambridge of the U.S. Institute of Peace. Chip Hauss of the Alliance for Peacebuilding then talked about his organization’s work. The afternoon focused on a visit the State Department which then was followed by a welcome dinner. On Saturday, October 22, 2016 the program started with a talk on teaching peace by activist Colman McCarthy, who has spoken at every seminar. He talked about the prevalence of war and violence in our society, and ways to challenge that paradigm. Heather Payne then discussed her experiences as a graduate student studying conflict resolution at George Mason University. She was followed by Randall Amster of Georgetown University, who talked about his work on peace ecology. Lunch included an alumni panel consisting of Kathy Rowell of Sinclair College and Heather MacCleoud of NAFSA. In the afternoon Merve Stolzman from the American Red Cross discussed principles of International Humanitarian Law and Cindy Epperson from St. Louis Community College shared with the group strategies for teaching about violent extremism. In addition, Michelle Breslauer from the Institute for Economics and Peace talked about the Global Peace Index and how it might be used by educators. In the evening, Mark Schulte shared the work of his organization, the Pulitzer Center on Crisis Reporting, and showed a segment of the upcoming film The Life Equation. On Sunday, October 23, 2016, I had a chance to share about my work with community colleges – “Peacebuilding in Community Colleges: The Road Traveled, The Road Ahead” – and promoting careers in peacebuilding with community college students. Rhonda Fitzgerald also talked about the work of the Sustained Dialogue Institute, and how dialogue can be used with graduate students. I also shared with the group the Conflictstudies.org open source book project. Monday, October 24, 2016 was a field day with visits to the U.S. Institute of Peace and the U.S. Holocaust Memorial Museum. Between those visits, the group visited with an official of the National Park Service who provided tours of the Lincoln Memorial and the Martin Luther King, Jr. Memorial. The program agenda is attached.